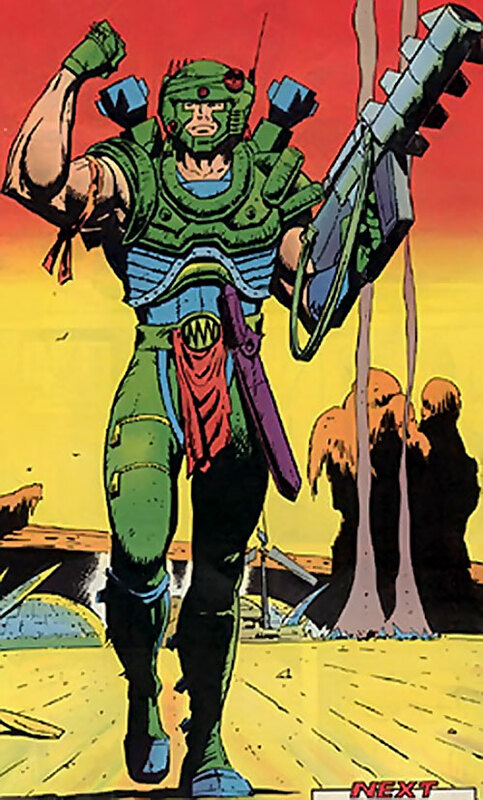 Dragon’s Claws was a post-apocalyptic action series from Marvel UK, published in 1988. I don’t think it had a significant visibility in the US. Though it was short-lived, it was sort of cool. 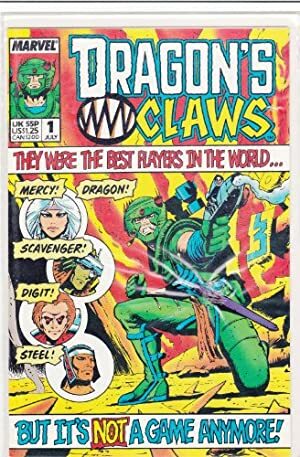 The titular Dragon’s Claws are a group of badass death sports gladiators who become sort-of-good-guys mercenaries on a dying future Earth, in the year 8,162. Known Relatives: Tanya Ritinski (estranged wife), Michael (adoptive son). Group Affiliation: Leader of Dragon’s Claws ; agent of the National Union of Retired Sports Experts. Base Of Operations: What’s left of Greater Britain in the year 8162 – the difference between “Greater Britain” and Great Britain wasn’t explained but it seemed to involve colonial holdings. At that point of history, Earth is broken. It is slowly drifting toward the sun for unknown reasons. The moon has been at least partially destroyed. Most of the large bodies of water have evaporated – leaving gigantic beaches with a few pools of stagnant saltwater for miles and miles. The animals left are few and far between. Humanity as a whole seems to have thrown up its hands in the air and given up. There are no apparent great human goals. People just pass the time until they die. Most countries have broken up in small kingdoms, varying from the high-tech arcocity to Mad Max-esque thugs roaming aimlessly about. Social unrest and riots are a constant problem in major cities. The police forces seem outmatched, outstretched and out of sleep. There is something that looks more or less like a planetary ruling body – the World Development Council. Its influence seems uneven. In some places it’s the actual government, in some places people have barely heard of it. The W.D.C.’s approach to global unrest was classic : panem et circenses. Thus was born the Game. Originally it was a sort of team paintball competition. It gradually became a hugely popular bloodsport, and continued to degenerate until it was a free-for-all. The best team in the tournament was the widely popular Dragon’s Claws. Another favourite and close competitor were the Evil Dead. Unlike the Dragon’s Claws, the ED racked a body count in the hundreds. As the Game was starting to cause more unrest than it solved, the WDC decided to stop it. They created the National Union of Retired Sport Experts (NURSE) to try to provide gainful employment for ex-players who couldn’t managed to find any. They certainly didn’t want the dogs of war to be let loose. Dragon is a veteran of more than 20 years as a Game player and as a merc. He is a formidable soldier, commando, tactician and strategist. He’s quite probably the best small-unit leader left on Earth. He’s also a redoubtable hand-to-hand fighter, a crack shot, and an expert with a large number of weapons and vehicles. Dragon is an exceptional leader. Without him the Claws are a pathetic rabble of psychotic and/or irresponsible misfits. With him they are the most efficient combat unit on the planet. He excels at devious strategy, surprise movements, dirty tricks and thinking outside the box. His ability to predict his opponent’s moves borders on the infernal. Every apparent weak point in his strategy is likely to be both a feint and a trap, as long as he has enough information to reason with and a few seconds to bark orders. Use misdirection (his Omni-gadget is often an hologram projector). Have his enemies fight each other. Use a liberal amount of booby traps. A classic Dragon move was luring Slaughterhouse to Dragon’s sniper perch, on a girder in a building under construction. Slaughterhouse being much more acrobatic and faster than even Dragon, he happily engaged Dragon in close combat on the girder. He did not pause to think that it was a stupid position for Dragon to put himself in. Dragon tackled him and threw himself and Slaughterhouse into a 30-stories fall, the move blindsiding Slaughterhouse. Dragon’s fall was stopped after barely one meter by the tether had had attached to his ankle. Slaughterhouse’s wasn’t. Dragon was originally a nameless boy found running wild in the slums. He couldn’t tell who were his parents, or whence he came from. He was raised in the World Development Council’s Trent Orphanage, and named “Dragon” after his fiery temper and uncontrollable nature. As a young man, he found an outlet for his energy in sports. The lad excelled at a wide variety of athletic and combat disciplines. Highly cunning rather than academically brilliant, Dragon had little use for schooling. He only seemed interested in pursuing a life based around the newly created Game – the WDC‘ s pacifying ’hunter and hunted‘ combat sport. His first game as field runner for the Courtland Rangers ended in tragedy. Dragon quit, disappearing for several years. He re-emerged in the African Colonies in 8148, leading a hardline team of ex-mercenaries on combat drops in the war-torn remains of Sudan. Injured in 8149, Dragon was ferried back to Greater Britain by his childhood friend, Titus Carling. Carling — now head of the vast Texcorp Conglomerate — saw to Dragon’s convalescence and re-integration into society. Once more, it was the Game that fired Dragon’s enthusiasm. He set about forming his own team over the next few years. By 8155, the Dragon’s Claws were competing for the championship. The Claws reached Division Three (Rogue League) before their blocker, Megaton, quit due to disagreements with Dragon. The recruitment of Steel, in 8157, took them to the top of the League Of Nations. Dragon took the Claws out of competitive events in 8158, after the Miami bloodbath. Through N.U.R.S.E., Dragon was relocated to a small farm on the outskirts of London. In 8159, Dragon met and married Tanya Ritinski. He adopted her son, Michael, as his own. At this point, the Game was stopped by the WDC, since it had gotten out of hand. Life on the farm was good. But Dragon was tortured by his deep need for action – which his wife sensed, and loathed. After the Game was stopped, marauding teams of players with the same lust for combat as Dragon’s became a major problem for law enforcement. The worst were outright outlaws, criminals and terrorists like the former #2 team, the Evil Dead. The Evil Dead could easily defeat ten times their number in military police. N.U.R.S.E. then organised a sort of a SWAT team to handle ex-Game teams. They offered Dragon the chance to lead it. Dragon first turned down the offer for his wife’s sake. However, he was soon caught in an altercation with ex-Game C-listers, the Wildcats. The Wildcats followed him home and attacked the farm. Although he managed to kill them all, the damage was done. Dragon’s addiction to action was now even stronger than he was, and he agreed to N.U.R.S.E.’s offer. N.U.R.S.E. reunited him with the Claws, and the fearsome Dragon’s Claws were back into action. A smart, reserved NCO and veteran. He likes to see his orders followed and his team focused. He neither sees his team nor himself as murderers, and is usually reluctant to use lethal force unless the alternative wouldn’t make sense. Dragon is an ethical man. He prefers to make sure that he works for the morally superior side. He won’t agree to have the Claws take down people who aren’t criminals of some sort. This sort of good will is rare in the ninth millennium, and he’s seen as being unusual for it. Dragon has tried to live a peaceful life as a farmer. But his need for action, fighting and adrenaline is pathological, physical, addictive. He simply needs it, even when it goes against his best judgement, harnessed willpower and love for his wife and son. Credentials (NURSE, Medium), Expertise (The Game’s rules and teams), Leadership, Lightning Reflexes, Rich Friend (NURSE expense account), Scholar (Tactics). Titus Carling (Low), Dragon’s Claws (High). MIA toward Thrill of Adventure, Public ID. BODY ARMOUR [BODY 07, Skin armour: 02, Limitation : Skin Armour is Partial (Long coat), Drawback: Real Armour]. Shortsword [BODY 06, Enhance (EV): 02 (cap is 05), Descriptor: Slashing and/or piercing]. Assault Rifle [BODY 05, Projectile weapons: 07, Telescopic vision: 02, Ammo: 10, R#02, Advantage : Autofire]. Anti-personnel mine [BODY 03, EV 12 (Area of Effect 0 AP), Grenade drawback]. Grenade [BODY 03, EV 07 (Area of effect 1 P), Grenade drawback]. Source of Character: Dragon’s Claws comics (Marvel UK).